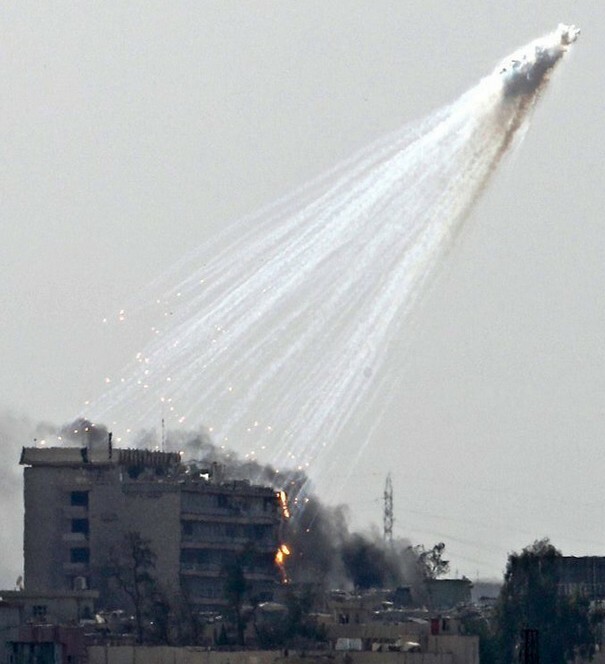 The U.S.-led coalition in Syria has been accused of using white phosphorus incendiary munitions for the fourth time since mid-September. White phosphorus use is banned internationally in areas with civilian populations. Syrian state news agency SANA reported a bombing conducted by the U.S.-led coalition targeted the small city of Hajin in Syria’s Eastern Deir Ez-Zor province over the weekend, allegedly intended to target Daesh (ISIS) terrorists who control the city, killed fifteen civilians – among them women and children – and injured scores more. Civil sources cited by SANA reported that white phosphorus bombs had been used, which – in addition to resulting in several civilian deaths and injuries — caused massive property damage due to the fires resulting from the use of the banned substance.